Boston, MA — Six months after the FTC warned six companies their “void warranty if removed” labels are forbidden under warranty laws, a survey by the consumer group U.S. PIRG Education Fund found that the vast majority of appliance manufacturers continue to oppose independent repair. Of the 50 appliance manufacturers surveyed, 45 automatically void the warranties if the device had “unauthorized” repair. “Consumers benefit when they can choose where to take their electronics for repair. 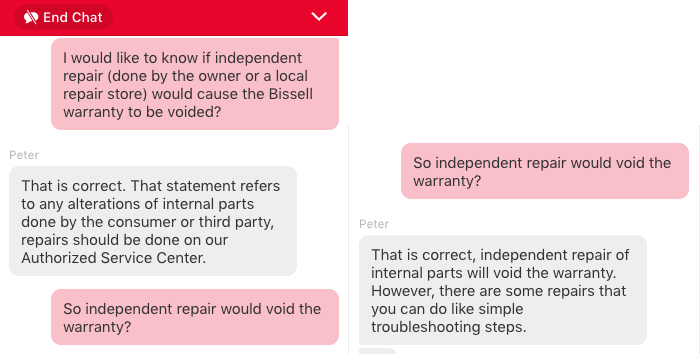 This important report from U.S. PIRG Education Fund reveals that some manufacturers may be duping customers into believing the warranty requires them to use only repair services that the manufacturer authorizes. This is contrary to the law. We urge federal authorities to investigate and take action to ensure consumers are getting the full and accurate information. We also urge states to pass their own Right to Repair laws to expand consumers’ options for getting independent repair,” said Maureen Mahoney, Policy Analyst, Consumers Union.